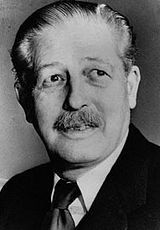 Maurice Harold Macmillan, 1st Earl of Stockton, OM, PC (February 10, 1894 – December 29, 1986), was a British Conservative politician and Prime Minister of the United Kingdom from 1957 to 1963, having previously served as Chancellor of the Exchequer. This was a period of prosperity as Britain recovered from the economic devastation of World War II and Macmillan's phrase, "You've never had it so good," may be said to have characterized his approach to governance. Increased production of steel and automobiles led to greater export earnings and also in pay raises for British workers. Inflation, however, threatened to hinder this growth, so how to curb inflation, he said, was the "$64,000" question. His main focus as Prime Minister was on the economy, but in the end an increase in unemployment and his policy of wage rise restraints led to the election of Harold Wilson's Labour government in 1964, although Macmillan had stepped down the previous year. Harold Macmillan was born in Chelsea, London, England, to Maurice Crawford Macmillan (1853-1936) and Helen (Nellie) Artie Tarleton Belles (1856-1937). His paternal grandfather, Daniel Macmillan (1813-1857), was the Scottish crofter who would go on to found Macmillan Publishers. Harold was first educated at Summer Fields School and then at Eton, but was expelled—according to Woodrow Wyatt—for buggery, though an alternative version argues he left due to illness. He attended Balliol College, Oxford, although he only completed two years of his classics degree—taking a first in Mods—before the outbreak of World War I. He served with distinction as a captain in the Grenadier Guards during the war and was wounded on three occasions. During the Battle of the Somme, he spent an entire day wounded and lying in a foxhole with a bullet in his pelvis, reading the Greek writer Aeschylus in the original language. Macmillan lost so many of his fellow students during the war that afterwards he refused to return to Oxford, saying the university would never be the same. He was a director of the Great Western Railway before rail nationalization. He married Lady Dorothy Cavendish, daughter of Victor Cavendish, 9th Duke of Devonshire on April 21, 1920. Between 1929 and 1935, Lady Dorothy had a long affair with the Conservative politician Robert Boothby, in the public view of Westminster and established society. Boothby was widely rumored to have been the father of Macmillan's youngest daughter, Sarah. The stress caused by this may have contributed to Macmillan's nervous breakdown in 1931. Lady Dorothy died on 21 May 1966, aged 65. Elected to the House of Commons in 1924 for Stockton-on-Tees, he lost his seat in 1929, only to return in 1931. Macmillan spent the 1930s on the back benches, with his anti-appeasement ideals and sharp criticism of Stanley Baldwin and Neville Chamberlain serving to isolate him. During this time (1938), he published the first edition of his book, The Middle Way, which advocated a broadly centrist political philosophy both domestically and internationally. In the Second World War, he at last attained office, serving in the wartime coalition government in the Ministry of Supply and the Colonial Ministry, before attaining real power upon being sent to North Africa in 1942, as British government representative to the Allies in the Mediterranean. During this assignment, Macmillan worked closely with Dwight Eisenhower, a friendship that would prove crucial in his later career. He returned to England after the war and was Secretary of State for Air for two months in 1945. He lost his seat in the landslide Labour victory that year, but soon returned to parliament in a November 1945 by-election in Bromley. With the Conservative victory in 1951, he became Minister of Housing under Winston Churchill and fulfilled his conference promise to build 300,000 houses per year. He then served as Minister of Defence from October 1954. By this time he had lost the wire-rimmed glasses, toothy grin, and brylcreemed hair of wartime photographs, and instead grew his hair thick and glossy, had his teeth capped and walked with the ramrod bearing of a former Guards officer, acquiring the distinguished appearance of his later career. He then served as Foreign Secretary from April-December 1955, and Chancellor of the Exchequer 1955-1957, under Anthony Eden. In the latter job, he insisted that Eden's de facto deputy Rab Butler not be treated as senior to him, and threatened resignation until he was allowed to cut bread and milk subsidies. During the Suez Crisis in the description of opposition Labour Shadow Chancellor Harold Wilson, MacMillan was "First In, First Out:" First very supportive of the invasion, then a prime mover in Britain's withdrawal in the wake of the financial crisis. Harold Macmillan became Prime Minister and leader of the Conservative Party after Eden's resignation in January 1957, surprising observers with his appointment over the favorite, Rab Butler. Once elected, Macmillan filled government posts with 35 family members, 7 of whom sat in Cabinet. Following the technical failures of a British independent nuclear deterrent with the Blue Streak and the Blue Steel projects, and the unilateral cancellation of the Skybolt missile system by U.S. Defense Secretary Robert McNamara, Macmillan negotiated the delivering of American Polaris missiles to the UK under the Nassau agreement in December 1962. Previously, he had agreed to base 60 Thor missiles in Britain under joint control, and since late 1957, the American McMahon Act had been eased to allow Britain more access to nuclear technology. These negotiations were the basis for Peter Cook's satire of Macmillan in Beyond the Fringe. Macmillan was a force in the successful negotiations leading to the signing of the 1962 Partial Test Ban Treaty by Britain, the United States, and the Soviet Union. His previous attempt to create an agreement at the May 1960 summit in Paris had collapsed due to the Gary Powers affair. Britain's application to join the EEC was vetoed by Charles de Gaulle (January 29, 1963), in part due to de Gaulle's fear that "the end would be a colossal Atlantic Community dependent on America" and in part in anger at the Anglo-American nuclear deal. Macmillan brought the monetary concerns of the Exchequer into office; the economy was his prime concern. However, Britain's balance of payments problems led to the imposition of a wage freeze in 1961, and this caused the government to lose popularity and led to a series of by-election defeats. He organized a major cabinet change in July 1962, also named "the night of long knives" as a symbol of his betrayal of the conservative party; he therefore continued to lose support from within his party. The cabinet changes were widely seen as a sign of panic, and the young Liberal MP Jeremy Thorpe said of Macmillan's dismissal of so many of his colleagues, "greater love hath no man than this, than to lay down his friends for his life." His One Nation approach to the economy was to seek high employment. This contrasted with his mainly monetarist Treasury ministers who argued that the support of sterling required strict controls on money and hence an unavoidable rise in unemployment. Their advice was rejected and in January 1958, the three Treasury ministers Peter Thorneycroft, the Chancellor of the Exchequer, Nigel Birch, Economic Secretary to the Treasury, and Enoch Powell, the Financial Secretary to the Treasury, resigned. Macmillan brushed aside this incident as "a little local difficulty." Macmillan supported the creation of the National Incomes Commission as a means to institute controls on income as part of his growth-without-inflation policy. A further series of subtle indicators and controls were also introduced during his premiership. Macmillan also took close control of foreign policy. 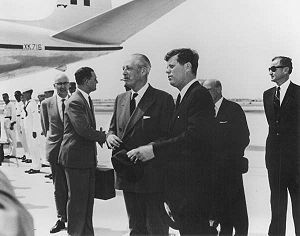 He worked to narrow the post-Suez rift with the United States, where his wartime friendship with Dwight D. Eisenhower was key; the two had a productive conference in Bermuda as early as March 1957. The cordial relationship remained after the election of John F. Kennedy. Macmillan also saw the value of rapprochement with Europe and sought belated entry to the European Economic Community (EEC), and explored the possibility of a European Free Trade Area (EFTA). Macmillan's term saw the first phase of the African independence movement, beginning with the granting of independence to the Gold Coast, as Ghana, in 1957. His celebrated "wind of change" speech (February 1960) is considered a landmark in this process. Ghana and Malaya were granted independence in 1957, Nigeria in 1960, and Kenya in 1963. However, in the Middle East Macmillan ensured Britain remained a force, intervening over Iraq in 1958 and 1960, and becoming involved in the affairs of Oman. He led the Conservatives to victory in the October 1959 general election, increasing his party's majority from 67 to 107 seats. The successful campaign was based on the economic improvements achieved, the slogan, "Life's Better Under the Conservatives" was matched by Macmillan's own remark, "indeed let us be frank about it—most of our people have never had it so good," usually paraphrased as, "You've never had it so good." Critics contended that the actual economic growth rate was weak and distorted by increased defense spending. The Profumo affair of spring and summer 1963 permanently damaged the credibility of Macmillan's government. He survived a Parliamentary vote with a majority of 69, one less than had been thought necessary for his survival, and was afterwards joined in the smoking-room only by his son and son-in-law, not by any Cabinet minister. Nonetheless, Butler and Maudling (who was very popular with backbench MPs at that time) declined to push for his resignation, especially after a tide of support from Conservative activists around the country. However, the affair may have exacerbated Macmillan's ill-health. He was taken ill on the eve of the Conservative Party Conference, diagnosed incorrectly with inoperable prostate cancer. Consequently, he resigned on October 18, 1963. He was succeeded by the Foreign Secretary Alec Douglas-Home in a controversial move; it was alleged that Macmillan had pulled strings and utilized the party's grandees, nicknamed "The Magic Circle," to ensure that Butler was not chosen as his successor. Alec Douglas-Hume, who became Prime Minister October 20, 1963, had to resign his seat in the House of Lords and for two weeks was a member of neither house of parliament until he won a safe seat in a Commons by-election. On October 19, 1964, he handed over to Harold Wilson, who became the nation's third Labour Prime Minister. Macmillan initially refused a peerage and retired from politics in September 1964. He did, however, accept the distinction of the Order of Merit from The Queen. After retiring, he took up the chairmanship of his family's publishing house, Macmillan Publishers. He then brought out a six-volume autobiography; the read was described by his political enemy Enoch Powell as inducing "a sensation akin to that of chewing on cardboard." His wartime diaries, published after his death, were much better-received. When I ventured the other day to criticize the system I was, I am afraid, misunderstood. As a Conservative, I am naturally in favor of returning into private ownership and private management all those means of production and distribution which are now controlled by state capitalism. I am sure they will be more efficient. What I ventured to question was the using of these huge sums as if they were income. In 1984, he finally accepted a peerage and was created Earl of Stockton and Viscount Macmillan of Ovenden. In the last month of his life, he observed: "Sixty-three years ago … the unemployment figure [in Stockton-on-Tees] was then 29 percent. Last November … the unemployment [there] is 28 percent. A rather sad end to one's life." In the House of Lords in the 1980s, he praised the miners then on strike, asserting that they had "beaten the Kaiser's Army" and "beaten Hitler's Army." Historian Andrew Roberts checked each of the three occasions on which Macmillan was wounded in the First World War; on each of these the miners had also been on strike. Macmillan died at Birch Grove in Sussex, in 1986, aged 92 years and 322 days—the greatest age attained by a British Prime Minister until surpassed by James Callaghan on March 26, 2005. The Macmillan family graves in 2000 at St.Giles Church, Horsted Keynes. Harold Macmillan's grave is on the right. ↑ BBC, 1957: Britons have "never had it so good." Retrieved July 8, 2007. ↑ Hendrik Bering, Taking the Great out of Britain. Retrieved July 8, 2007. ↑ Simon Ball, The Guardsmen, Harold Macmillan, Three Friends and the World They Made (London: Harper Collins, 2004). ↑ Alan Watkins, A Conservative Coup (Duckworth, 1992), p. 105. Macmillan, Harold. The Wind of Change: Harold MacMillan February 3 1960. 2007. Macmillan, Harold. The Blast of War, 1939-1945. New York: Harper & Row, 1968. This page was last modified on 1 August 2017, at 22:20.